In a time where there are increasing concerns all across Europe about filling the growing number of STEM-related jobs and how to go about addressing the widening skills gap, there is more impetus than ever to encourage both young children and teenagers to become more engineering savvy. Consequently, we have seen a considerable surge in the educational toy market over the last few years, with a plethora of exciting new product offerings coming to the fore. Getting ‘hands-on’ with technology is not actually that new of course. I grew up in the days when Meccano was at the height of its popularity – with most boys my age owning kits. Things have moved on significantly though. Back then, Meccano solely catered for would-be mechanical engineers and was predominantly male-focused. Now the objective is to encompass a broader spectrum of engineering disciplines – and also appeal, in equal proportions, to both males and females alike. Produced by a mixture of established brands and newer firms, a diverse range of child-friendly maker platforms has emerged. Despite each one taking its own distinctive form, all of them tend to share common goals. These are to make technological creativity more accessible, elevate the levels of engagement (whether this is in a classroom environment or back home) and, as much as possible, keep the barriers to entry low (so kids that aren’t put off at an early stage, because everything looks too complicated). Danish toy manufacturer Lego was among the first companies to recognise the need for a more multifaceted platform – where mechanical engineering, electronics engineering and coding were all adequately encompassed. A little over 5 years ago, it released the Lego Mindstorms EV3. This features an array of sensors (including colour, touch and rudimentary proximity), along with motors, programmable circuitry (which is contained within the ‘Brain Brick’), a power pack (that relies on the use of 6x AA batteries), plus numerous Lego Technic components. Bluetooth connectivity and an infra-red remote control system are also included. With the ability to be controlled by smart devices (such as a tablet computer or smartphone) handset, fledgeling engineers get the opportunity to undertake the creation and subsequent programming of their own robotics projects. To support this, Microsoft offers its MakeCode software package. Through it, users can code in an extremely straightforward manner – via a simple drag-and-drop approach. There are various programming blocks to choose from, which are then placed onto the programming canvas – allowing the motor control, sensory inputs and other key functions to be dealt with in turn. Taking things slightly further is the Vex IQ. 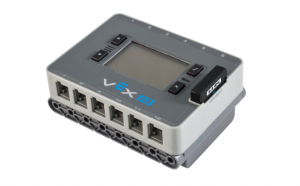 In a similar fashion to Mindstorms EV3, this has a central ‘Electronic Brain’ module, with 12 configurable ports through which it interfaces with sensors, motors and encoders. This utilises an 80MHz Tiva MCU from Texas Instruments, which is capable of 100MOPS operation. The module comes loaded with default programs, as well as allowing customisation of existing projects or full programming of new projects from scratch (via the slick visually-oriented programming tool). A video gaming style controller is paired with the module. As it has an RF-based remote control, projects created using this platform (unlike their Lego counterparts) are not dependent on line-of-sight. Another trailblazer has been littleBits, which looks to address a somewhat younger audience with a broad array of colourful modules that snap together through magnets. The modules are all categorised using 4 different colours – blue for power (with the modules here attaching to batteries), pink for input (such as light sensors, push buttons, slide switches, microphones, etc. ), green for output (LEDs, buzzers, motors, matrix displays and suchlike) and orange for wire (for interconnection purposes). Ensuring safety, the magnetic poles mean that the modules can’t be put together in the wrong orientation. The littleBits hardware can interface with Lego so that kids are not constrained regarding what they want to build. Meccano has also moved on quite a lot from my day. Among the portfolio of products that the company has introduced to cater for aspiring young engineers are its MicroNoid robots – which are generally aimed at the 8-11 age group. Once assembled, the user can provide these automatons with specific movement sequences to follow, or create little tunes for it to playback, through push button programming. Alternatively, more complex programming can be embarked upon by using the USB cable provided to connect to a laptop and employing the intuitive software that can be downloaded from the company’s website. Having successfully reached its crowdfunding target earlier this summer (raising nearly 3x the original sum required), Smartibot is another simple platform that is looking to capture the imagination of society’s younger generations and aid their technological expression. 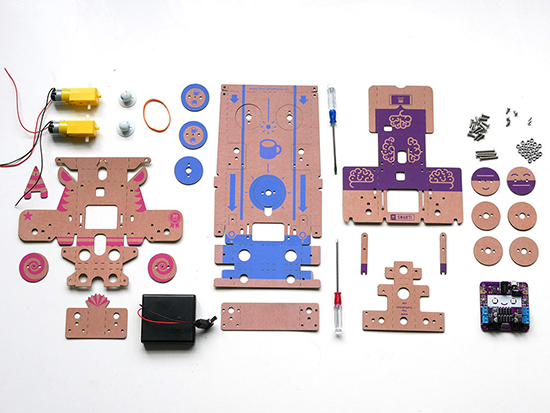 Developed by UK start-up The Crafty Robot, it basically works in conjunction with the user’s smartphone handset – providing an easy-to-assemble, environmentally-friendly cardboard chassis from which a relatively basic, mobile robot can be constructed. 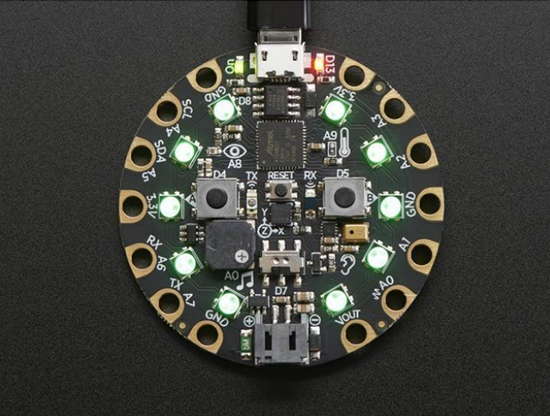 This can be customised as the user wants, or even just ditched in favour of an entirely new design concept made out of any materials available – just retaining the circuit board, motors and battery pack (which runs off 4x AA batteries). By incorporating a smartphone into this central hardware, the robot can carry out numerous functions, without any in-depth programming being required. This goes from standard remote control all the way up to rudimentary examples of autonomous operation (with the Smartibot app making use of artificial intelligence for object recognition purposes). Up to 14 different motors (4 DC motors and 10 servos) can be accommodated within the design framework. This means that there is ample scope to build all manner of different robot types – wheeled robot units, bipeds, quadrupeds, robotic arms, tracked vehicles and even potentially drones or hovercraft. Through this product offering, like the others already mentioned, children can become more familiar with mechanical engineering and also (if they choose to) learn the principles of programming. Also, it gives them the chance to develop project management, problem-solving and general organisational skills that will benefit them in the future too. 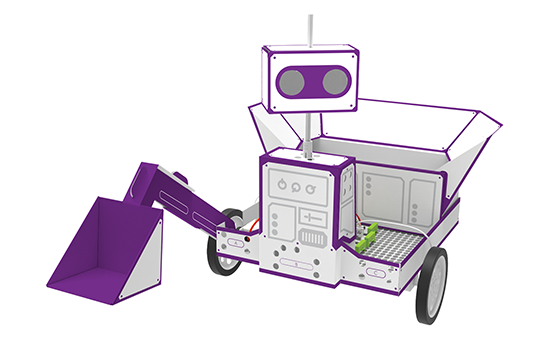 The team at The Crafty Robot are currently working with Microsoft to get Smartibot integrated into the MakeCode platform. The first batch of kits are being shipped now, ready for Christmas. Aimed much more at the classroom than family use, is the highly regarded Digilent Analog Discovery 2. This compact multi-function test and analysis unit works in conjunction with the WaveForms virtual instrument suite, allowing users to examine the signals emanating from circuits they have put together and gain a better understanding of the different dynamics involved. Positioned at an attractively low price point, it comprises a 2-channel USB oscilloscope (with 14-bit resolution and a 100MSample/s sampling rate), a 2-channel arbitrary function generator (with a bandwidth of over 12MHz), a spectrum analyser and a 16-channel digital logic analyser, plus a pair of programmable power sources. Through the items discussed in this article, there is clearly now a great deal of more assistance that can be sought by youngsters looking to explore the realm of modern engineering than was the case back in my era. Such hardware and associated software is helping to nurture children’s nascent inventiveness – enabling rewarding experiences to be derived from interacting with technology. Mark joined Mouser Electronics in July 2014 having previously held senior marketing roles at RS Components. Prior to RS, Mark worked at Texas Instruments in applications support and technical sales roles. He holds a first class Honours Degree in Electronic Engineering from Coventry University.